Heavy Duty construction with beautiful brass fittings. Great candle powered lantern. Really elegant with a locking door. Comes just as you see it, fittings, leather, buckle and tip, assembled. Very light, strong and super cool! 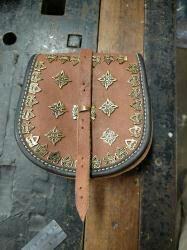 add leather and you have a one of a kind period belt.